Leapfrog are a brand that we love,in fact the majority of the toys that Blake owns are by Leapfrog. We are excited that we were sent two wonderful toys from the brand for Blake to have fun playing and learning. Both toys are suitable for ages 2 years and over. First up is the Leapfrog fridge numbers magnetic set which is the perfect toy to introduce children to numbers and counting. The fridge number magnetic set is a colourful fridge magnet, which also acts as a tile reader and comes with 20 interactive number tiles. Place a tile in Scout’s picnic basket to hear the number out loud, and count along with Scout. Matching numerals to object sets help reinforce the concept that numbers represent quantities. £14.99. Blake hasn't really taken much interest yet in this toy. However I feel that as he isn't 2 until next week that as he gets a little older he will start to take more interest. He did however recognise Scout as he has the My Pal Scout which he adores and sleeps with every night. Blake absolutely adores this toy and he will spend most of his time when playing with it in the music mode. I feel that this toy will grow with him and once he starts learning numbers and colors he will enjoy doing more of the memory games. I fully recommend these new toys by Leapfrog they are fun and engaging and will grow with your child as they start to learn numbers, colors etc and will keep them entertained. One thing I have always liked about Leapfrog toys is that they have not just got an off switch, but they have 2 volume settings which is great as some toys can be really loud. 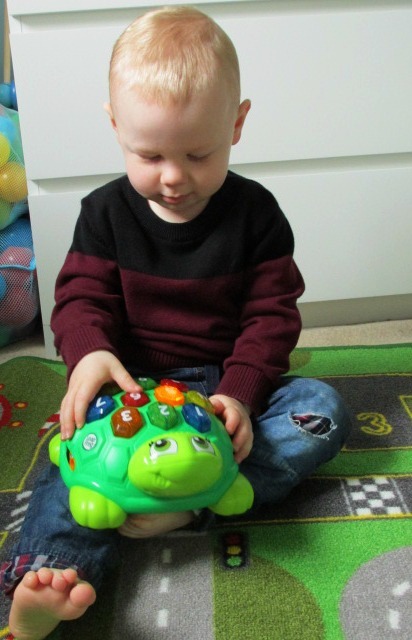 As you can see in the photo below Blake is really enjoying playing with the Melody musical turtle. Do you and your child/ren love the leapfrog brand? If so what is their favorite toy from them? As always I'd love to know so comment below your thoughts.